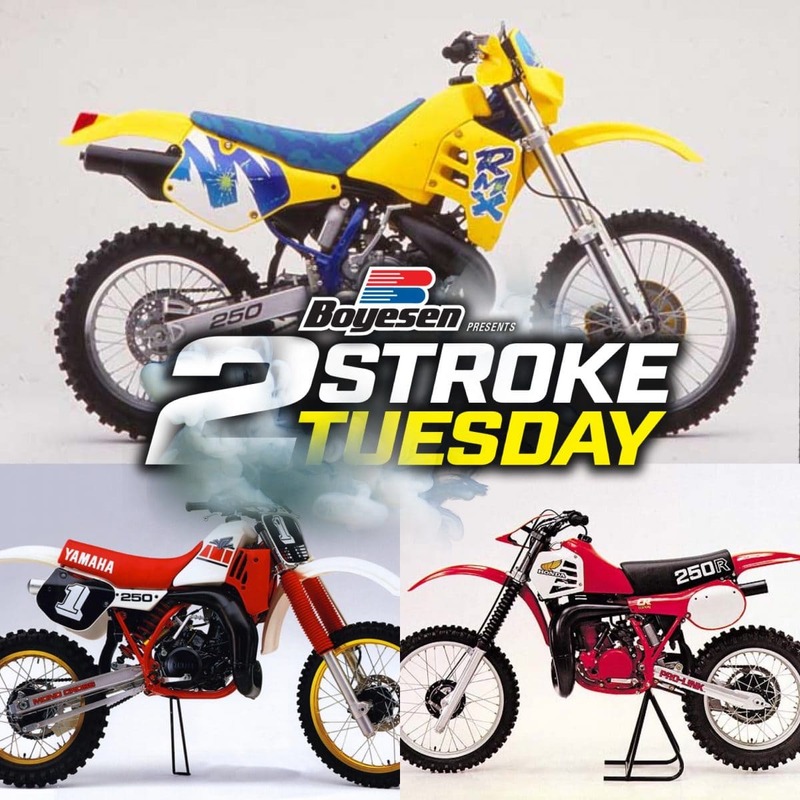 On this week’s Two-Stroke Tuesday we take a look back at three iconic 250cc machines that changed the course of motocross history all over the world. The Yamaha YZ250, Suzuki RM250 and Honda CR250 shaped the motocross world as we know it today and we give you exclusive links to their historic family tree’s. As always 2-Stroke Theater is packed full of premix madness and Kawasaki faithful we have a treat for you at the bottom of this post. You don’t want to miss this! The history of the Yamaha YZ250 is the history of motocross in America. No other machine was the platform for so many world-shaking innovations. The list of firsts goes on and on: reed valves, single-shock suspension and power valves all started with the Yamaha. There’s no telling what the history of motocross would look like if not for the YZ250 and the people behind it. But it certainly would be very, very different. For more on the Yamaha YZ250 Click Here or on the image above. The story of the Suzuki RM250 isn’t just about a single motorcycle. It’s about a dynasty of bikes, championships and riders that goes back to a glorious era in the history of motocross. Back in 1965, Suzuki launched a massive development program to build the world’s best motocross bike. It wasn’t based on market research, computer forecasts or industrial analysis. It was all about gut instinct and passion. Back in 1965, Suzuki launched a massive development program to build the world’s best motocross bike. For more on the history of the Suzuki RM250 Click Here or the image above. There are timeless classics in each field, and in the dirt bike world, there’s nothing that has reached that status like the Honda CR250R. Even though it’s been out of production in the U.S. since 2007, the CR probably won more combined amateur and professional races than any other motorcycle in the dirt world. And they are still out there winning. The CR is a hot commodity on the used-bike market, and on start lines across the world they still outnumber many current models. Click here or the image above for the complete history of the Honda CR250. If you like history and 2-Strokes check out this piece on the mighty Kawasaki KX500. Click the image for more!